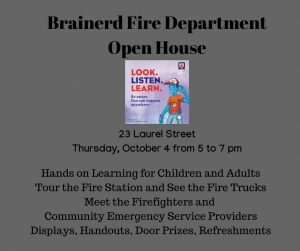 Annual Fire Department Open House. Participate in hands-on learning for children and adults. Tour the fire station and see the fire trucks. Meet the firefighters and community emergency services providers. Displays, handouts, door prizes, and refreshments.